Are All Fly Boxes the Same? For any fly fishing angler, having efficient storage for your ever-growing collection of flies is important. Thankfully, through years of thought and innovation, today's fly storage boxes offer anglers quick and easy storage and content identification. In order to maximize your efficiency on the water, having a well-organized fleet will be a big help. Fly boxes come in all sorts of shapes and sizes and will accommodate a large variety of fly types and sizes. A proper option is going to depend on the flies it holds. You will want a small box to hold nymphs, another small one to hold dries, and other larger ones for streamers. 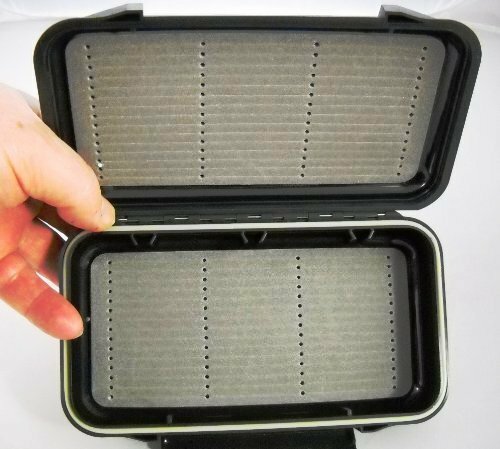 You will always be in search of the perfect fly box. Some people prefer a traditional book-style opening, while others prefer a two-sided design. Both have their advantages and disadvantages and you should try both to determine your best fit. Personally, I appreciate a clear design. This allows for quick and easy identification of contents without having to open and close different boxes. I also appreciate a pre-slit, high-density foam design. Thankfully, this is the norm nowadays. This helps to increase the longevity of your foam and makes fly removal and loading quick and easy. Most feature waterproof designs, though not all do. Be sure this is something you consider in deciding what you need most. This is usually a feature of the more durable, high-density plastic designs. A snap lock lid assists in this ability. So what makes a great fly box? It really depends on personal preference in many scenarios. Everyone has a different method for organizing and transporting their collection of flies. It will depend on which bag you use to fish and the size of your fly collection. However, there are a few things that I think should be a feature of all top pick, regardless of a user's particular preference. 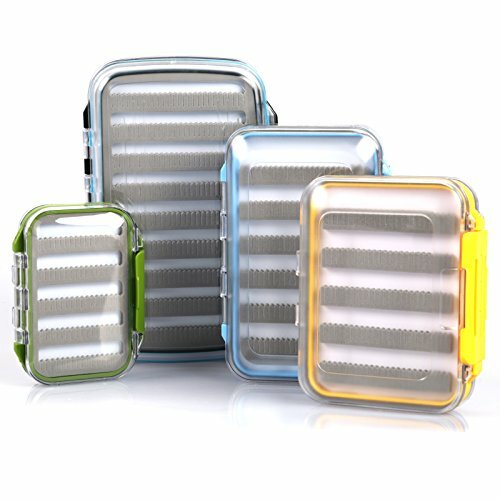 If I am purchasing a fly box, here are some things I like to look for. Two sided storage with pre-slit foam is a must! Pre-slit Foam: This type of foam design aids in foam longevity. It also makes fly removal and loading a quick and easy task. Two-sided storage: Unless I need a tiny box for a certain application, having two-sided fly storage is a no-brainer. The more flies the better. Clear lids: Personally, I like to be able to quickly and easily identify the contents of my box. I don’t always want to open and close a bunch of boxes. Clear lids make sure I don’t have to. Durable: It should go without saying, but I want a fly box to be durable. I want a secure snap-lock design and a constructed foam impact-resistant plastic. Waterproof: When you fly fish, you are obviously going to be around water. This lends itself to the possibility of dropping your fly box in the water. To better protect your flies, you don’t want them to get wet and therefore have to dry out all of your fly boxes and flies. Waterproof designs mitigate most concerns about this. Selection is key to proper fly organization. In order to efficiently spend your time on the water, being able to quickly switch between flies is a must. When you are sorting through, trying to figure out what the fish are eating, a properly organized set up will make this an easy task. In addition to organization, these serve an important purpose of protecting your valuable flies. They keep them from getting crushed and from being continually soaked. A single model can easily hold hundreds of dollars in flies, so you want to make sure it is going to hold up. These also allow for easy transport of flies. Being able to stack several boxes in a bag or even slide one into your pocket makes getting out there to fish, the quick and easy task it should be. However, fly boxes can become troublesome at times. It is easy to lose your organization and be left with a mess of flies. Some people recommend using a very large master fly box and then transferring flies to a fishing box for the day. This ensures you will always be organizing flies and maintaining inventory. Now we're going to switch gears and take a look at some of the best options currently on the market. Here, we'll be taking a close look at what makes each model stand out. Let's get started! 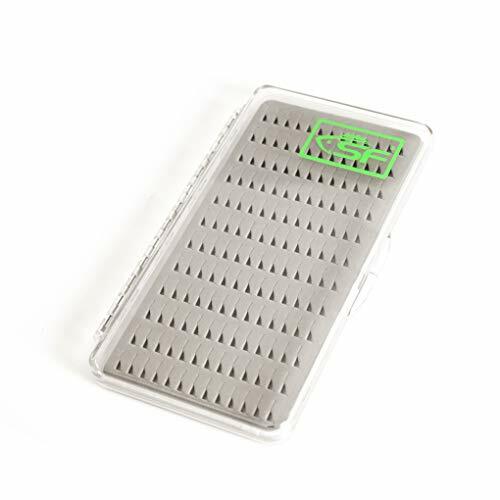 Ultra-durable and reliably waterproof, the Flies Direct Fly Box is a safe bet to hold your flies. A dual-sided, book style design features pre-slit, high-density foam on each side. All in all, you could potentially hold 126 flies in this box. At about 5”x3”x1.4”, it is a nice compact design that may even fit in your pocket. The durable plastic design features black colored impact resistant ABS plastic. Surely it will withstand years of use and abuse protecting your collection of flies. This fly box has a silicone seal and secure snap to ensure it remains waterproof and buoyant thanks to its 100% floatable design. For a simple and traditional design with all the modern durability, look no further. A simple traditional book style design makes opening and viewing all your flies quick and easy. On top of that, it prides itself in being durable, waterproof, and has the ability to float. All of these features serve well to protect your valuable collection of fishing flies. A great, inexpensive option that will work for years to come. Looking for a box to hold some larger flies? Look no further. This box is a great storage system for larger streamers and salmon fishing flies. The box features two foam boards with slots for up to 365 flies. This is a larger box at around 7”x4”x2”. The nice, deep design will be well appreciated for larger bodied flies. The durable plastic design is solid black and features stainless steel hinges and pins. This will help to limit the amount of corrosion. Making it even suitable for large saltwater flies. If you are looking for a simple, no-frills box to store some larger flies, look no further. This ruggedly designed fly box has plenty of room for your larger flies. This box will get the job done and will be easy on your wallet. Looking for an ultra-slim and compact option? Check out the SF Super Slim. The unique design of this box prides itself in being one of the slimmest on the market at less than a ½ -inch thick. This allows you to have further precision in organizing a large collection of these. Alternatively, the slim design makes it a great back pocket or jacket pocket fly box. Another great feature is the different options in foam style. With varying numbers of foam slit styles available, you can cater it to your needs. 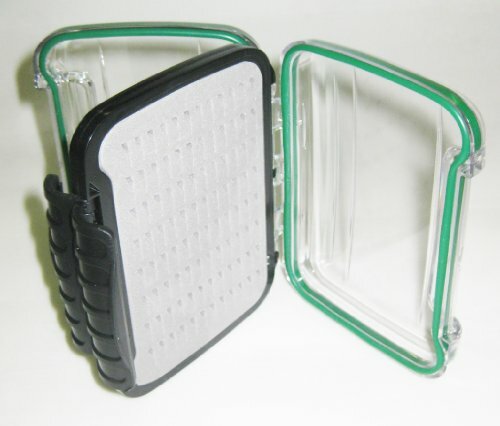 You also have the option of a box-style foam design to keep your small flies separated in compartments. This model fills a needed niche on the market, an ultra-slim design. You can also easily fit it in a pocket. Also, you can further separate out your flies for organization and have lots of fly boxes with more specific contents. For its compact design, it can’t hurt to have one in your arsenal. I always appreciate having a box I can throw in a coat pocket for a quick excursion. 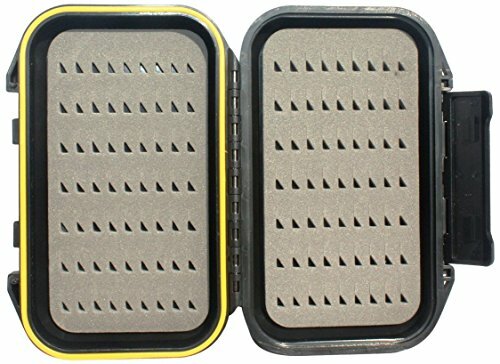 The Zaltana Waterproof Fly Fishing Box is a nice, convenient, dual-sided fly box with room for a variety of flies. This box features a design that opens on both sides, protected by crystal clear lids. Each side has pre-slit foam with room for 96 flies on each side or 192 flies total. The foam slits are spaced out in a manner that will offer storage for a versatile range of flies. The box is designed to be waterproof and is secured with a solid snap locking mechanism. The clear design makes it easy to identify box contents at a glance. Its deep wells can easily accommodate larger flies. At 5”x4”x1.5”, it is a nice, convenient, and versatile size for your collection. This model makes it easy to locate the fly you are looking for with its dual clear plastic sides. Its 192 fly capacity is great for carrying a variety of flies that are easily accessible. It is a great fly fishing box whether you need a variety of fly types or simply want to bring a large variety for whatever the day calls for. With an elegant design and four sizes to choose from this a must-have for your fly fishing collection. Each box features a two-sided opening design. Both sides of the inner flap have pre-cut foam slits with a design that makes loading even the tiniest flies a little less frustrating. The clear lids assist the angler in a quick identification of contents and are made of impact-resistant ABS plastic, helping to prevent accidental breaks and cracks. The double-sided gasket seal assists in ensuring the box remains waterproof. You want those flies dry until you are ready to use them. Being available in a wide variety of colors and sizes makes this a style that could house your entire fly collection. I really like the elegant design with ultra-clear plastic. The foam design is different from others and makes it slightly more functional, in my opinion. I don’t think you could go wrong with some of these to hold your fly collection. Fly boxes, compared to other fishing gear components, should require less maintenance. Most are built to be simple and durable, lending to a long life. The biggest threat to a fly box is the possibility of being crushed. Thankfully, most are designed with such in mind. Another weak point is the hinges. It may be good to periodically rinse your fly box free from grit and salt. Particularly if you have been fishing around saltwater. Other than that, a quick rinse every now and then should be all it needs. If you have a waterproof box, this will be easy. In the end, just be careful of sitting on or crushing your boxes and they should enjoy a long life. All the options in the world won’t help you without proper organization. For some, they may fall victim to the tragedy of horribly messy fly boxes. This somewhat defeats the purpose of a fly box other than the protection it offers. To ensure you can make quick and easy fly selections on the water, organization is paramount. In the video below, we discuss several different schools of thought in fly organization. Each person may find a different method to be suitable. First off, you can organize them by size. Have a box for size 2-6 flies, another for 6-10, and so on. However, this can get cumbersome. If you are just fishing with one type of fly, but modifying sizes, you will have to switch boxes. Also, in low light settings, identifying just what is in your box may become difficult. You can also organize by fly type. In this scenario, you will have a box for bait fish patterns, another for leeches, hoppers, damselflies of different stages, and so on. This is a method that works very well for some. With a variety of sizes of similar imitations in one box, it is easy to find what you are looking for. However, what many choose to do is to plan ahead for a specific outing and compile an assortment that will match. In this video, we discuss having specific boxes for specific scenarios. If you typically fish a few different fish types but always in consistent waters, consider having a box for each water. In this video, he discusses having a pond bass fishing box in addition to a trout stream box. Each box has flies that you would only expect to use or want in that given scenario. You can also have a large master box and assemble a fishing kit for every fishing excursion. For many people, this type of organization tends to be very efficient for when you are out on the water. Fly boxes are a key component to a fly fishing gear arsenal. They are the tool that protects and organizes your real weapons, your fishing flies. Having a fleet of fly boxes and system of organization will make fishing much easier and more enjoyable. Every angler is going to need a selection of fly boxes and it may take some time to figure out just what you need. Thankfully, there are plenty of budget and diverse options on the market for you to try.